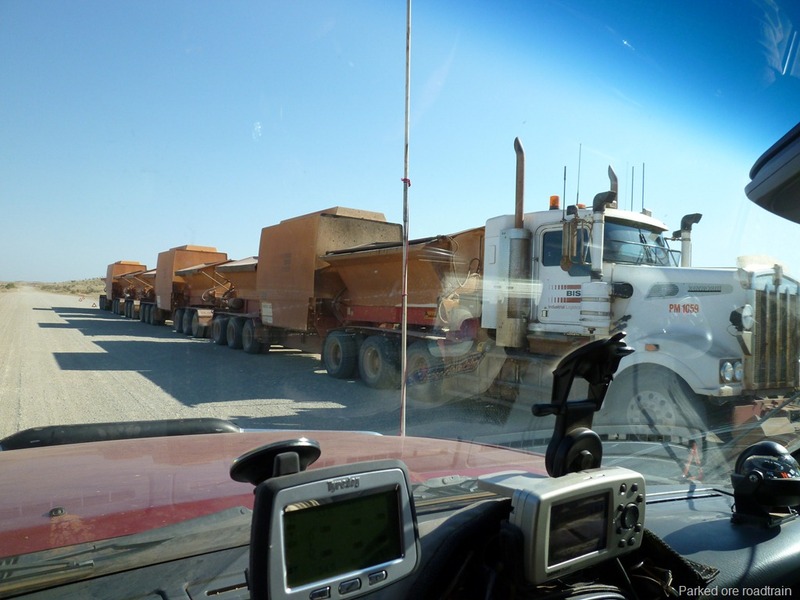 After departing our camp, and our dingo, on the Telfer Mine Road, it was not long before we met the bitumen. Pulled into a lay by and put all tyre pressures back up to highway pressure. We had reduced pressure in all tyres when we started on the dirt and this reduced pressure certainly makes a big difference to ride comfort and safety on dirt. There was a constant stream of road trains now. Some hauling equipment some ore. 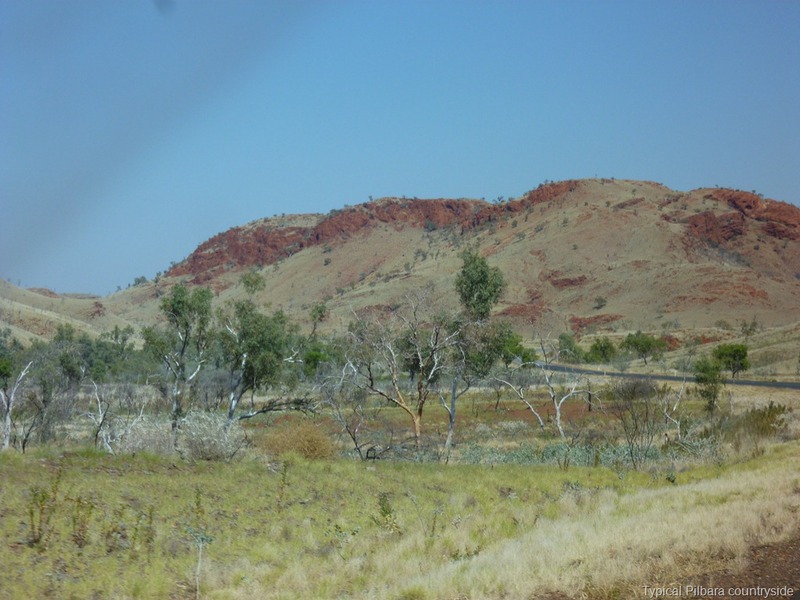 The countryside was now typical Pilbara, red rocky outcrops and jump ups. We made for Marble Bar for the simple reason that we had not been there before and therefore wanted to see what is called Australia’s hottest town. Marble bar turned out to be a small but very neat and tidy town. 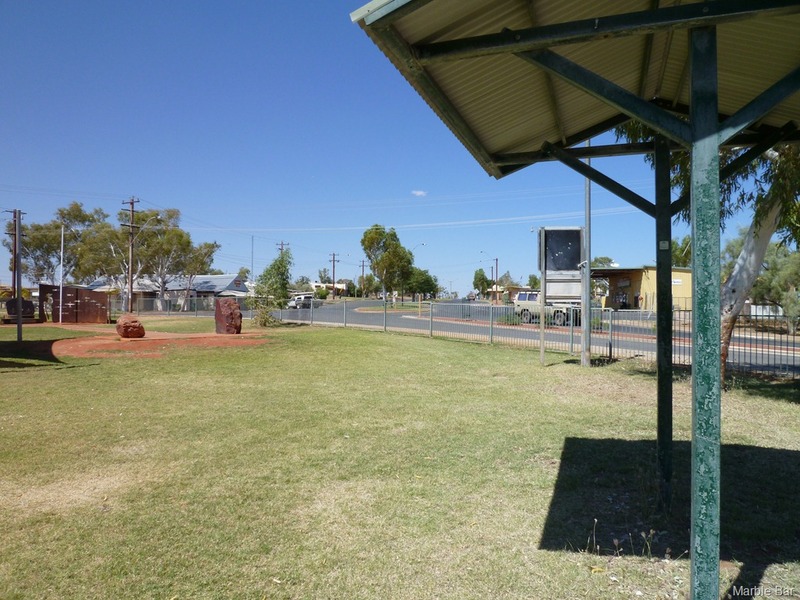 Two stores, council chambers, police, school, community internet and access centre, mining registrar and a pub. I think that was about it. There was a green grassy park with one of those high tech toilets. The town war memorial was also in the park and it was the best small town war memorial that I had seen. We purchased hamburgers with the lot at the store opposite the park and sat in the park to eat them. The hamburgers were great. As there was a water tap conveniently placed in the park we filled our water tanks. We then filled up with fuel before heading west looking for a camp site. Around 40 kilometres on we entered the Doolena Gap a very steep and twisty section of road with a 40 kph speed limit. Large signs instruct road train drivers to advise on UHF channel 8 when entering the gap from east or west. Just on the west of the gap we turned off onto a track that took us to a camp site at Doolena Gorge. Unfortunately the small pool of water in the gorge was not suitable for swimming but we found a nice site to camp under a ghost gum. Next morning we headed off early thinking “today we will have a swim”. We find that in the tropics we prefer to be on the road by 7:00 or so and then make camp by midday or shortly after. This ensures we are camped and not travelling during the hottest part of the day. After about 100 kilometres we joined the Great Northern H’way and the almost constant stream of Grey Nomads (and no Shane I refuse to be classed as a Grey Nomad – a Bald Wanderer maybe!). 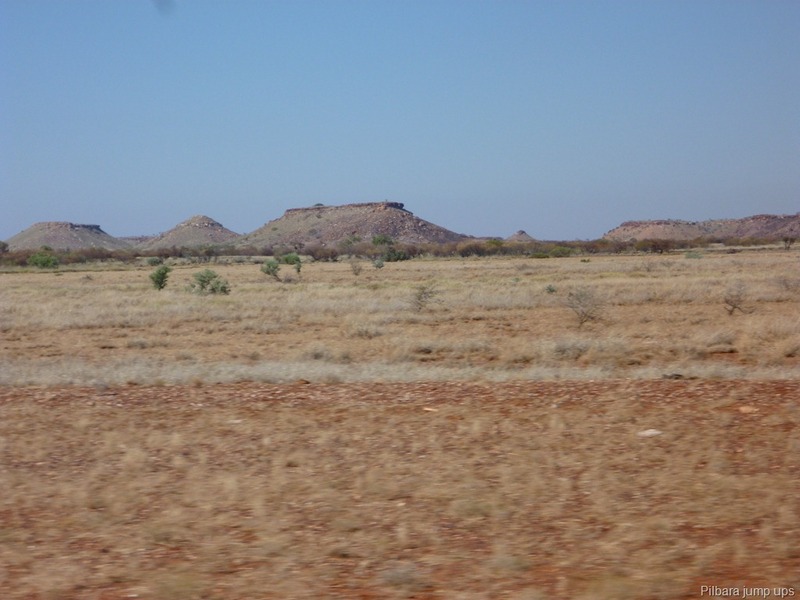 About 150 kilometres on this road brought us to the Pardoo Roadhouse and Tavern. This roadhouse is opposite the turn off to Cape Keraudren our destination for the day. We managed to get a couple of essential supplies here, bread (frozen of course) and joy oh joy a two litre cask of wine. This was great as our wine had run out two days ago. It was only a ten kilometre run into the Ranger Station at Camp Keraudren to pay our camping fees. Talking to the ranger we commented on the huge improvement in the road since we had been here two years ago. He told us the council had spent $3m sealing the road half way to the Ranger Station and improving the rest of the gravel roads. As a result caravans that would not have come in before are now venturing in and he has seen a 33% increase in camping this year. When the road is finally sealed to the Ranger Station the council intends to put a caravan park there and the present beachside camping areas will become day use only. Bloody progress! The Ranger warned us that the sand flies were particularly bad at the moment but hell we could see the sea so no mere sand fly was going to put us off swimming. Luckily a breeze was blowing as we made camp beside the beach so we escaped the sand flies. This is crocodile country and there is only one safe area to swim so we walked about a kilometre along the beach and fell into the water. Glorious. This “safe” area is a channel only about knee deep guarded by a sandbar that any crocodile would have to cross. But never the less we kept a wary eye out. I then pulled the fridge ventilators off and serviced the burner and the flue in the hope that this might improve the fridge’s performance. The breeze kept up during the evening so mossies and sand flies were not too much of an issue. We did however change to long sleeves and trousers with ugg boots. Internet connection here is spasmodic and unpredictable and we did not have any connectivity during the evening. This morning around six I turned the computer on and had a strong signal. This lasted for about two hours then cut off completely. No breeze early this morning and the sand flies are queuing up to have a go, I think they even got down inside my ugg boots. We have mosquito wire on all windows and door in the van but this is not fine enough to keep out sand flies. Sand fly wire is so fine that it stops too much ventilation to be really practical. Camping here is cheap at only $4.50 per person (for us old age pensioners) so even with the sand flies we might stay here a couple more days as when we leave here the camping fees start to get expensive and there is little if any free camping. 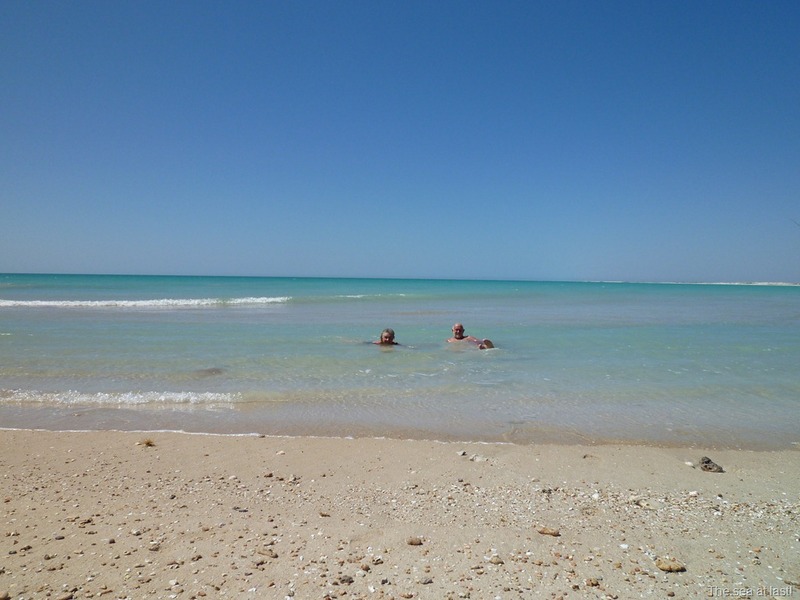 From here we will spend a couple of days at Eighty Mile Beach Caravan Park and then Barn Hill Station, both on the beach, before getting to Broome. We are a bit early in the season yet as the mass exodus south by the Grey Nomads is only just starting but this week should see a fair few on their way south. 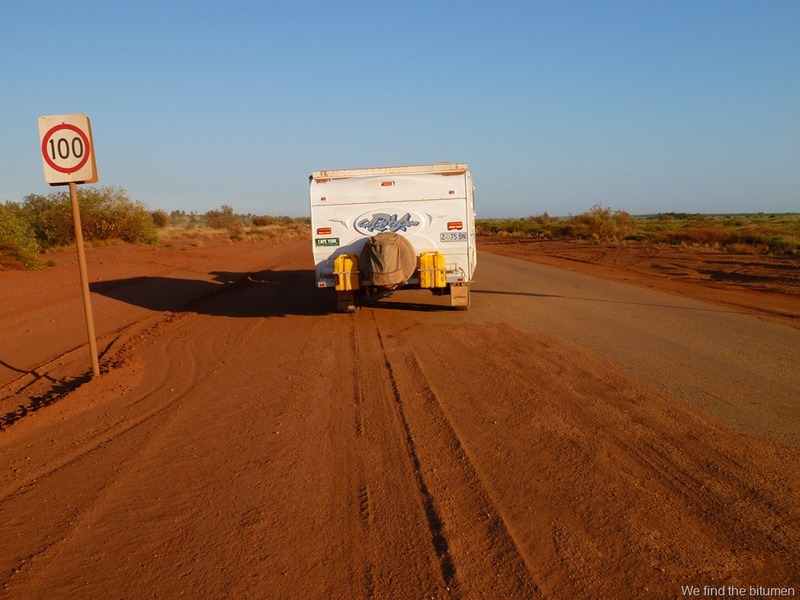 Hopefully by the time we do get to Broome caravan park fees should have gone down with the crowds. 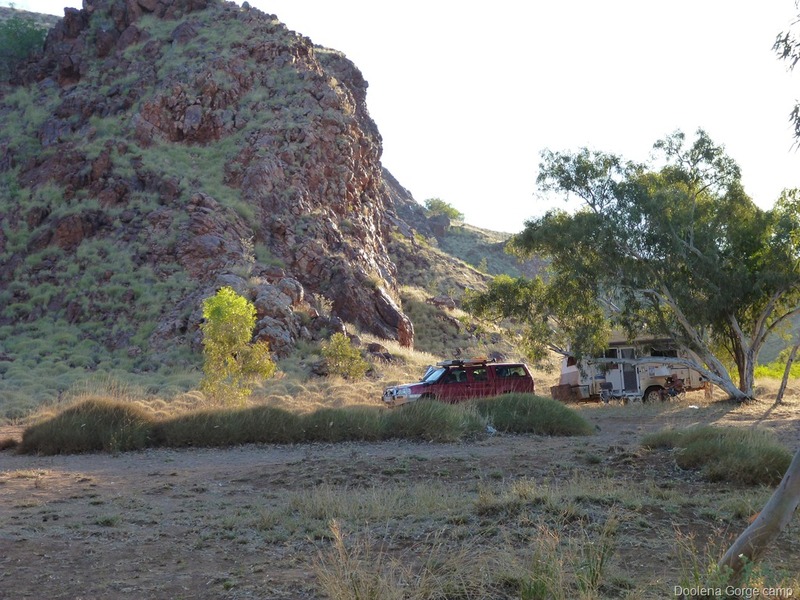 This entry was posted in On the wallaby and tagged Goldstream explorer, Marble Bar Western Australia, outback travel, Road train, Travel journal. Bookmark the permalink.